Plastic deviled egg platter holds 15 eggs around the rim of the platter, with room for another 6 in the middle. Center portion can be filled with salad or a bowl can be placed inside for condiments. 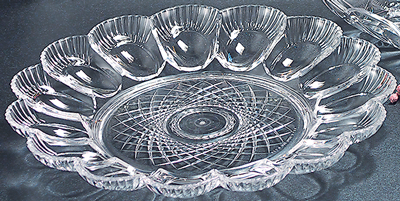 This is an elegant simulated crystal cut design platter. (W) 11 3/8" x (H) 1 1/2"